For the coastal trading vessel, see MV Shibam. 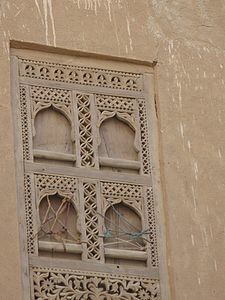 Shibam (Arabic: شِـبَـام‎, translit. 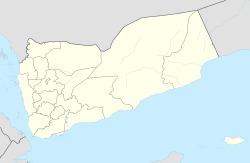 Šibām), often referred to as Shibam Haḍramawt (Arabic: شِـبَـام حَـضْـرَمَـوْت‎) is a town in Yemen. With about 7,000 inhabitants, it is the seat of the District of Shibam in the Governorate of Hadhramaut. Known for its mudbrick-made high-rise buildings, it is referred to as the "Chicago of the Desert" (Arabic: شِـيـكَاغـو ٱلـصَّـحْـرَاء‎), or "Manhattan of the Desert" (Arabic: مَـانْـهَـاتَـن ٱلـصَّـحْـرَاء‎). The first known inscription about the city dates from the 3rd century CE. It was the capital of the Hadramawt Kingdom. In the 20th century, it was one of the three major cities of the Qu'aiti Sultanate, the others being Al-Mukalla and Ash-Shihr. The city was listed with the UNESCO World Heritage List, in 1988. In 2008, a tropical cyclone flooded Shibam. During the Yemen Civil War the city suffered some damage  after insurgents detonated a car bomb. There was also coalition bombing the area. In 2015 UNESCO listed the city as “cultural heritage at risk”. The town is located in the central-western area of Hadhramaut Governorate, in the desert of Ramlat al-Sab'atayn. Its main road links Sana'a and other cities of western Yemen to the far eastern territories. Nearest towns are Seiyun, seat of an airport, and Tarim, both in the east. Another road, departing from the village of Alajlanya, in the west, links Shibam to Mukalla, governorate's capital, located by the Indian Ocean. Shibam has a hot desert climate (Köppen: BWh). At an average temperature of 28.0 °C, June is the hottest month of the year. January is the coldest month, with temperatures averaging 18.6 °C (65.5 °F). 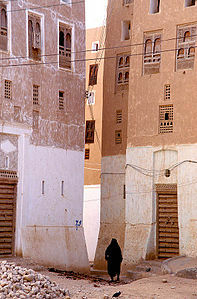 Shibam, which is now a UNESCO World Heritage Site, is known for its distinct architecture. 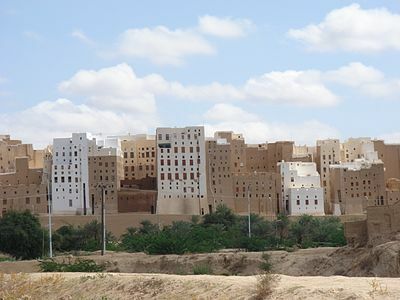 The houses of Shibam are all made out of mud brick, and about 500 of them are tower blocks, which rise 5 to 11 stories high, with each floor having one or two rooms. This architectural style was used in order to protect residents from Bedouin attacks. 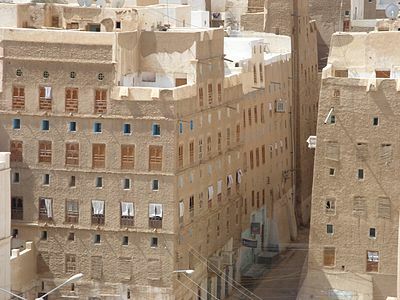 While Shibam has been in existence for an estimated 1,700 years, most of the city's houses originate from the 16th century. Many, though, have been rebuilt numerous times in the last few centuries. 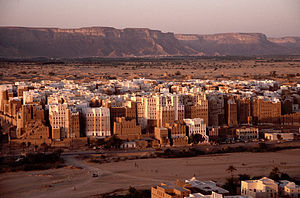 Shibam is often called "the oldest skyscraper city in the world". It is one of the oldest and best examples of urban planning based on the principle of vertical construction. The city has some of the tallest mud buildings in the world, with some of them over 30 m (98 feet) high, thus being early high-rise apartment buildings. In order to protect the buildings from rain and erosion, the walls must be routinely maintained by applying fresh layers of mud. The city is surrounded by a fortified wall, giving it the name "the walled city of Shibam." The nearby town of Tarim contains the tallest structure in the Wadi Hadhramaut valley, the mudbrick minaret of the Al-Mihdhar mosque. It stands at a height of approximately 53.53 metres (174 feet). This is the tallest minaret in the southern Arabian peninsula. The mudbrick buildings are frequently threatened by wind, rain, and heat erosion, and require constant upkeep in order to maintain their structures. The city was heavily affected by flooding from a tropical cyclone in 2008. The foundations of many of the buildings in the city were compromised by the flood waters, eventually leading to their collapse. It was also the target of an Al Qaeda attack in 2009. In 2015, Shibam was added to the list of World Heritage sites in Danger when violent civil war erupted in Yemen. Historic buildings were significantly damaged during heavy bombing in Sana'a, and remain at risk from armed conflict. ^ a b "Districts of Yemen". Statoids. Retrieved October 21, 2010. ^ a b c "The Ancient City of Shibam: The Manhattan of the Desert". Weather.com. 2013-11-09. Retrieved 2018-03-22. ^ a b c d مدينة شبام حضرموت "شيكاغو الصحراء". Al-Bayan (in Arabic). 2012-07-30. Retrieved 2018-03-22. ^ a b بلدة شبام حضرموت. Mawdoo3.com (in Arabic). 2017-04-06. Retrieved 2018-03-22. ^ a b "Wadi Hadramowt and walled city of Shabam". ShibamOnline.net. Retrieved 2010-01-03. ^ McLaughlin, Daniel (2008). "10: Southeast Yemen". Yemen. Bradt Travel Guides. pp. 191–198. ISBN 978-1-8416-2212-5. ^ Bricks and mortar fire: Yemen’s cultural heritage is in the crosshairs.December 17, 2015. ^ Gulnaz Khan, This Ancient Mud Skyscraper City is the 'Manhattan of the Desert'. National Geographic. ^ Yemen suffers cultural vandalism during its war. ^ This Ancient Mud Skyscraper City is the 'Manhattan of the Desert'. National Geographic. ^ Maggie Michael, Report details damage to ancient Yemeni archaeological sites November 15, 2018. ^ Helfritz, Hans (April 1937). "Land without shade". Journal of the Royal Central Asian Society. 24 (2): 201–16. doi:10.1080/03068373708730789. ^ a b Jerome, Pamela; Chiari, Giacomo; Borelli, Caterina (1999). "The Architecture of Mud: Construction and Repair Technology in the Hadhramaut Region of Yemen". APT Bulletin. 30 (2–3): 39–48 . doi:10.2307/1504639. JSTOR 1504639. ^ Shipman, J. G. T. (June 1984). "The Hadhramaut". Asian Affairs. 15 (2): 154–162. doi:10.1080/03068378408730145. ^ "Death Toll Mounts In Tropical Storm". CBS13.com. 2008-10-26. Archived from the original on 2009-03-22. Retrieved 2008-10-26. 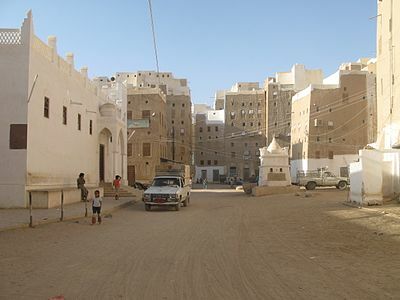 ^ "Historic Town of Shibam Hadramout Escapes Flooding Largely Unscathed". ITN Source. November 3, 2008. ^ "Al Qaeda blamed for Yemen attack". CNN. 2009-03-16. Retrieved 2009-04-26. ^ "Al-Qaeda in Yemen:Political, Social and Security Dimensions". Yemen Post. 2009-04-12. Retrieved 2009-04-26. ^ "List of World Heritage in Danger: The 54 properties which the World Heritage Committee has decided to include on the List of World Heritage in danger in accordance with Article 11 (4) of the Convention". UNESCO World Heritage Centre. 2015. Retrieved 2017-04-30. ^ Bokova, Irina (2015-05-12). "UNESCO Director-General calls on all parties to protect Yemen's cultural heritage". UNESCO World Heritage Centre. Retrieved 2017-04-30. In addition to causing terrible human suffering, these attacks are destroying Yemen’s unique cultural heritage, which is the repository of people’s identity, history and memory and an exceptional testimony to the achievements of the Islamic Civilization. Wikimedia Commons has media related to Shibam. Wikivoyage has a travel guide for Shibam.